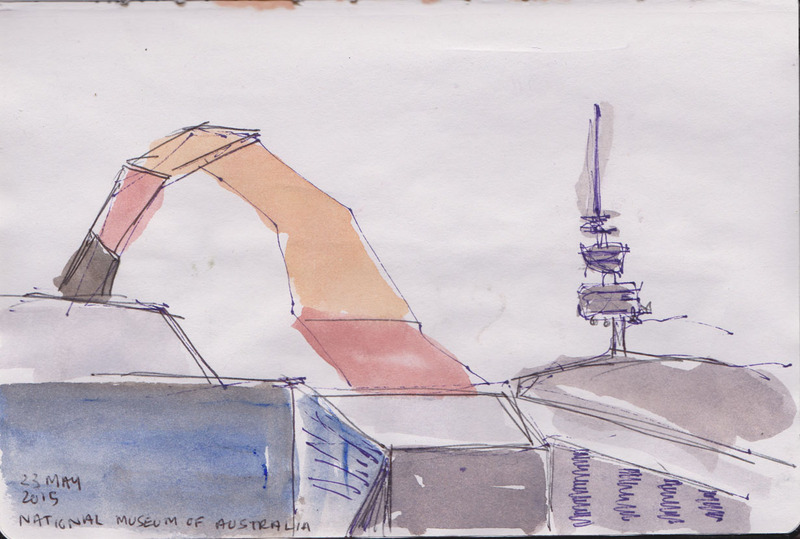 Last Saturday the some of the Canberra Sketchers met up with Angela from the Melbourne Sketch group at the National Museum of Australia for a couple of hours of drawing. We started over a cup of coffee and not surprisingly talk soon turned to favourite tools and tips. 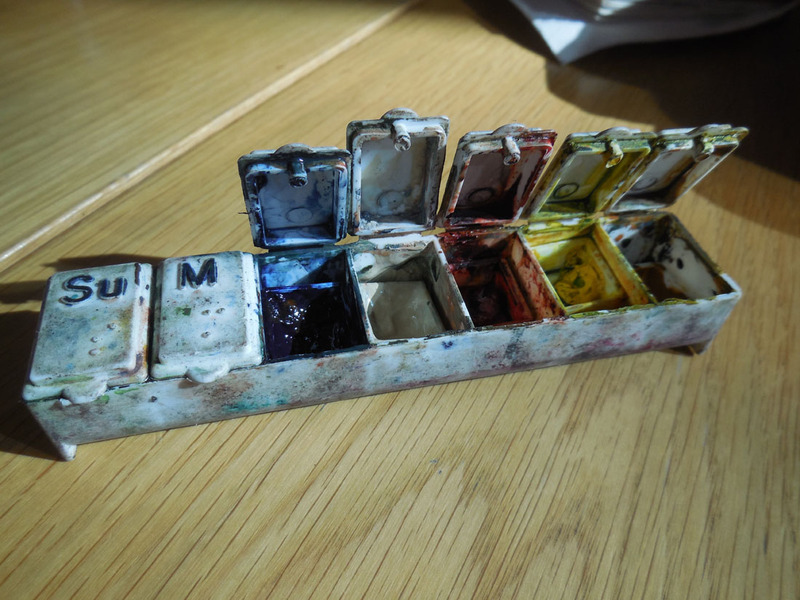 I really liked Angela’s solution to finding extra boxes for her watercolours. She bought a ‘seven day’ pillbox at a $2 shop and put her half pans into it. You can also just add tube paint in directly and mix on the lids! Down to work and the unusual architecture of the museum was the focus for many sketches. I chose to go into the Museum’s central courtyard, The Garden of Australian Dreams, where a stand of white barked gum trees were beautifully highlighted against the black museum wall. This wasn’t what I’d intended to draw but it caught my eye. What I did want to capture was The Loop, which springs up from the forecourt of the museum and arcs back into the central courtyard. I liked this view which also encompassed the Black Mountain Tower. I only had a short time to capture this before I met back with the rest of the group. We met in the entrance foyer to compare notes. It was clear that we could have spent the whole day drawing at the museum so it will be another venue for a repeat visit. 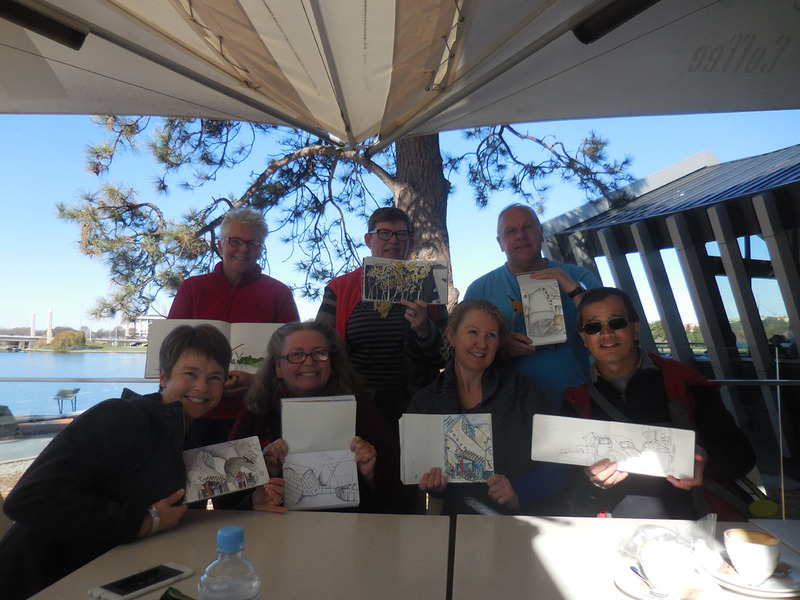 A quick reminder that the next meeting of the Canberra Sketchers group will be held at 10.30 am on Sunday 7 June at the Chinese Gardens, Flynn Drive, opposite the rear entrance of the Hyatt Hotel in Yarralumla. No cafe for me today. 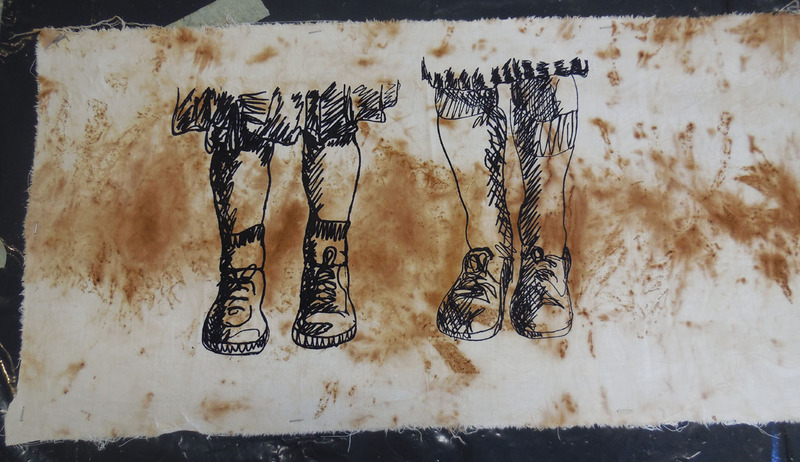 I was back at Megalo Print Studio + Gallery for my first screen printing session in ages. Things are starting off slowly. I’m looking at images for the show I’m in at the end of the year, so no time to waste. I’m testing out incorporating some of my drawing techniques into my work. My ideas often develop more quickly when I’m actually ‘doing’ rather than sitting and thinking, so here’s to ‘doing’. If you would like to see how Megalo operates there is a great, short video on their homepage, filmed by Rowan Grant of Sixth Row Productions. It turned out to be a brilliant weekend weather-wise. A perfect pair of Autumn days. Striking blue skies, a crisp temperature of 17C and virtually no wind. So on Sunday we packed some sandwiches and headed out to Namadgi National Park for a spot of bush-walking and painting. Our destination was Mount Aggie, at 1,421 metres (4,662 ft), which sits on the ridge-line which marks the western border between the Australian Capital Territory and New South Wales. Mt Aggie may not be the loftiest of peaks in the range but it’s summit is readily accessible by a fairly short and easy walking trail. 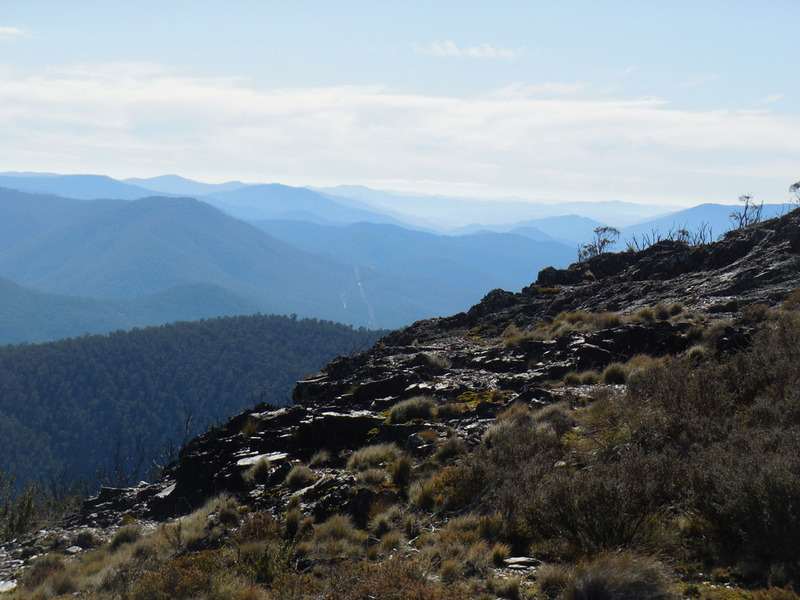 From the top there is a truly panoramic view out over the Bimberi Nature Reserve and Kosciusko National Park and even down to the Bogong Range in Victoria. We were particularly pleased to see a Wedge-tailed Eagle flying overhead shortly after we reached the summit. 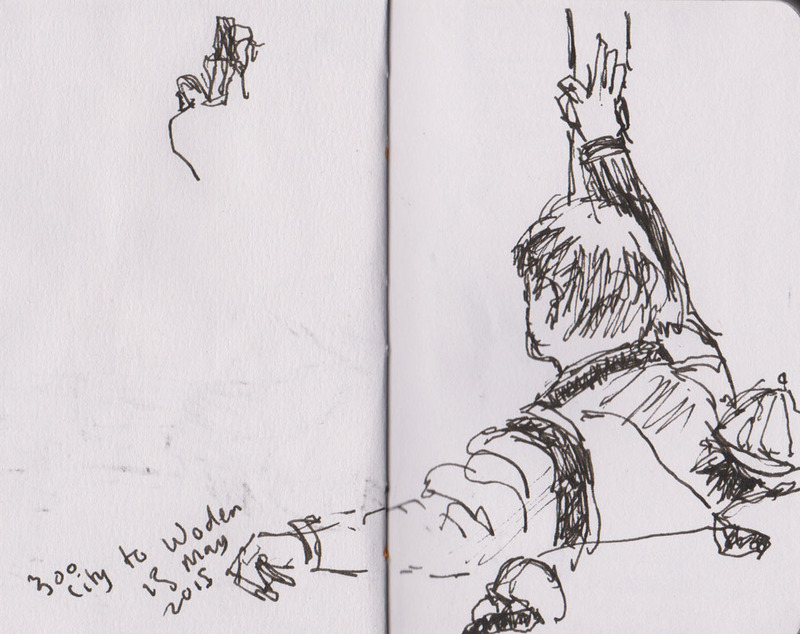 We had a great time drawing and only shared the summit temporarily with another small group of walkers. 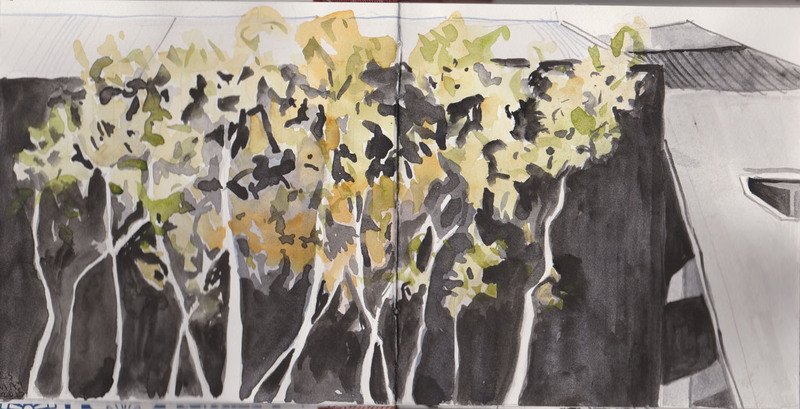 I tried to capture the ridges disappearing into the distance, using the double spread of my Moleskine watercolour book. I think I’d need 3 double pages to capture the full view. It was a truly magic day. 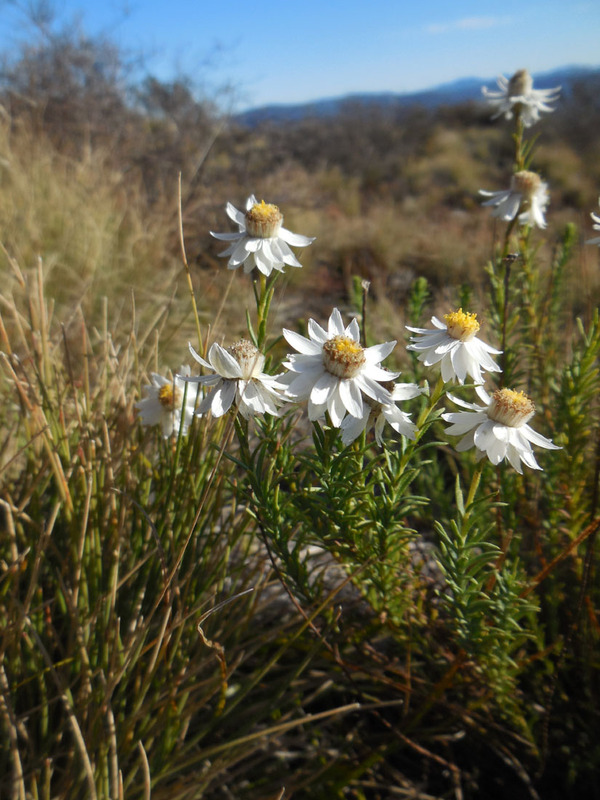 I’ll leave you with a shot of this small paper daisy, one of the last flowers of the season. 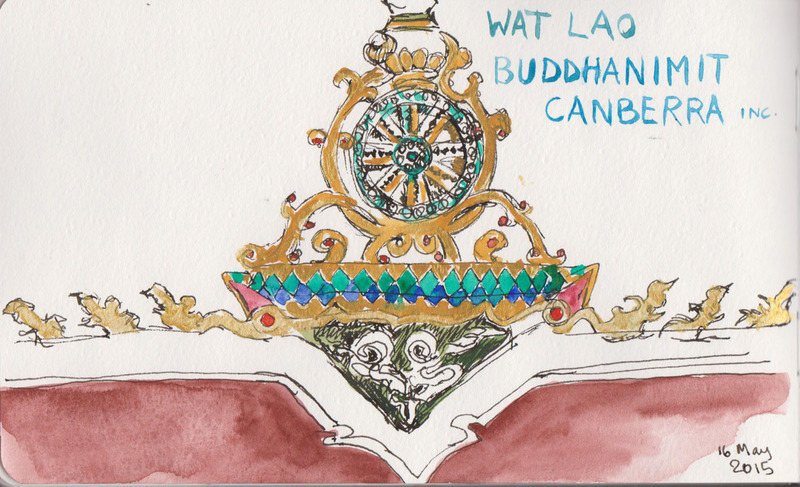 Yesterday the local Lao Buddhist temple held its annual food fair. The place was packed and the food was delicious. We took it in turns to choose dishes to eat and in the interim sketched the scene. Hundreds of people were there and overhead flags and bunting fluttered. After a while we shifted to a spot in the shade. I decided to paint the symbolic decorations on the top of the temple roof. Unfortunately I didn’t quite allow enough space for the very top of the central spire. Did I mention that the food was really good. Having eaten our fill we bought some to take home for later. 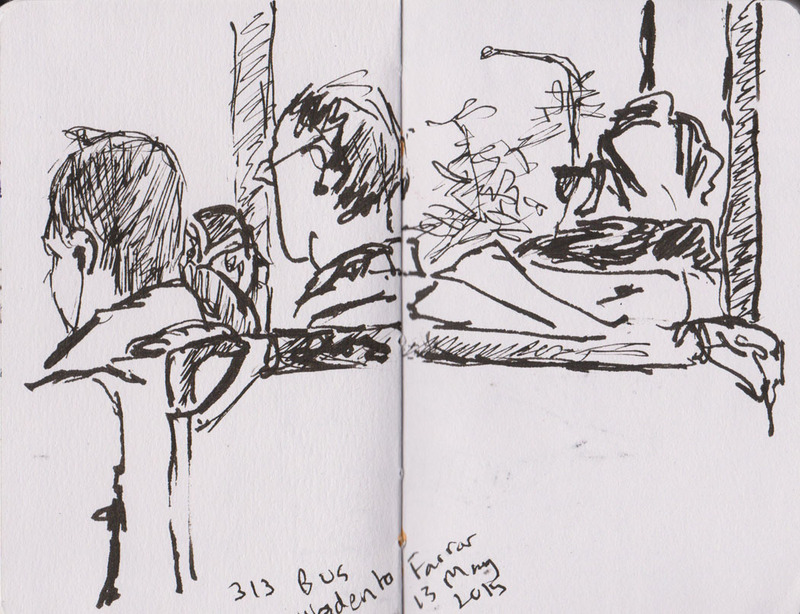 It’s been a while since I caught a bus into town so today I challenged myself to do one drawing for each leg of my journey – so 4 drawings in all. 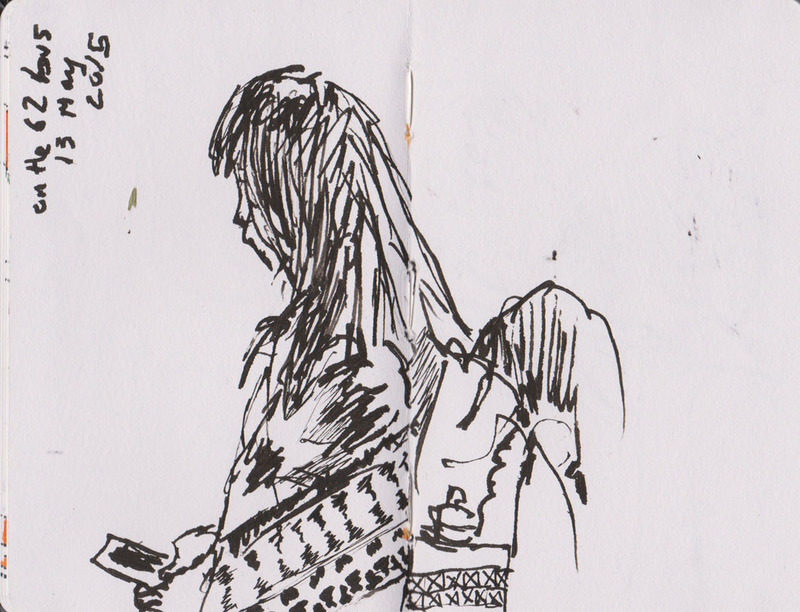 I used my small notebook (9cm x14cm) and my Duke 209 pen. Here are the two on the way into town. 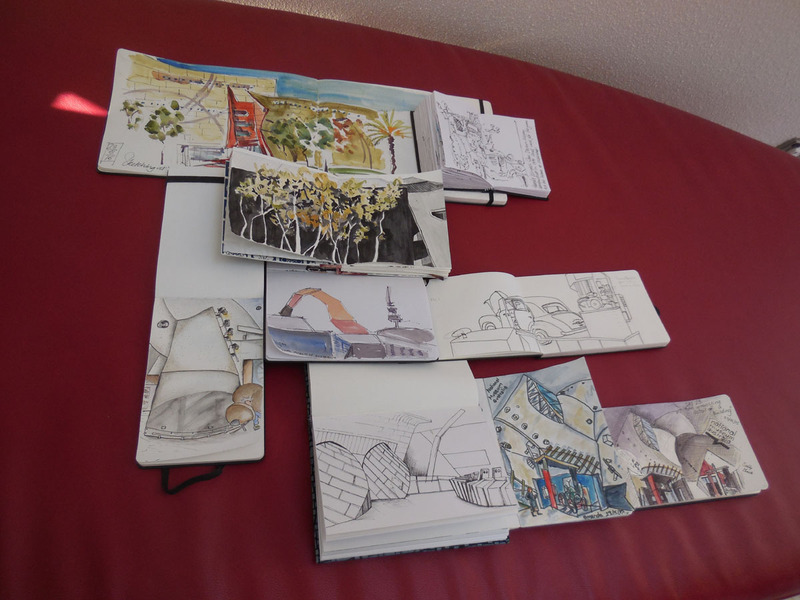 After my appointment I caught up with my partner who was drawing in Garema Place. 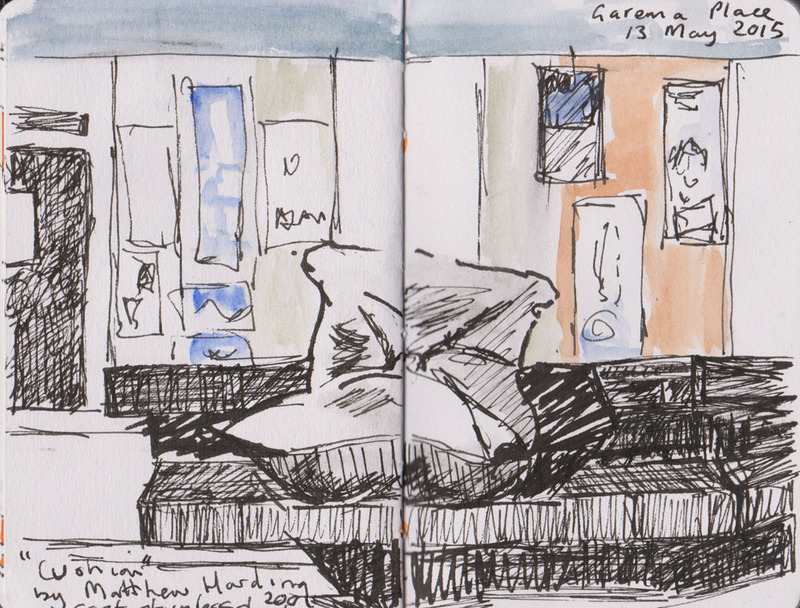 While he was finishing off his sketch I took the opportunity to draw Matthew Harding’s sculpture ‘Cushion’. On the way back home I finished these two drawings. 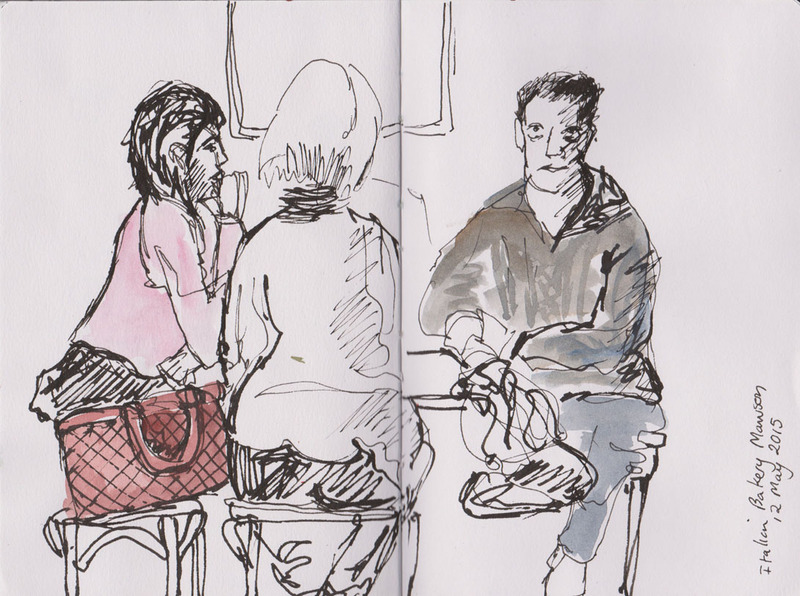 A quick sketch with some added watercolour from a cafe stop today. I still struggle with the idea of only adding highlights with watercolour rather than ‘colouring in’ my sketches. What I was really happy with when I made this sketch, was the performance of my modified Duke 209 fountain pen. Despite making progress in getting a thicker line with the modifications I’d made several weeks ago, the ink flow overall was still poor and very intermittent. The brand of ink I was using (Windsor and Newton Calligraphy Ink) was drying up between the ink cartridge and the nib. 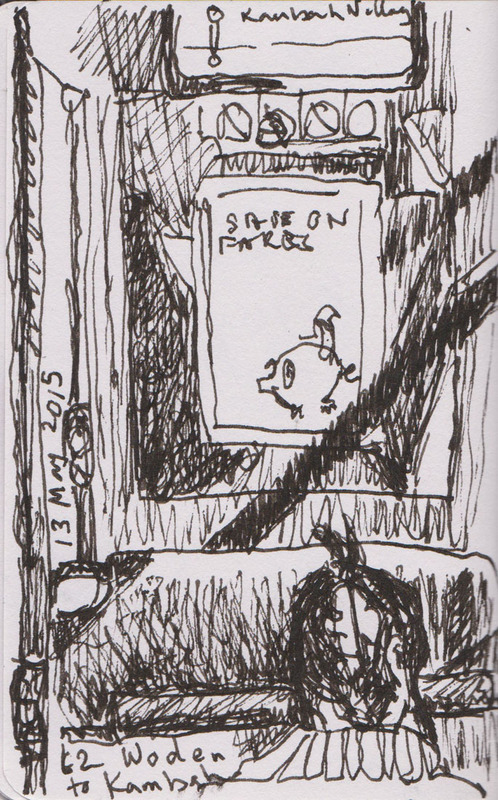 I was at the point of chucking the pen out but decided that maybe the problem was the ink not the pen! I put Noodlers Bulletproof Black into the cartridge and right away the ink was flowing. The ink has kept flowing even when I don’t use the pen for several days. I’d like to also pass on a tip I saw on someone’s video clip (possibly one from The Pen Habit) of turning the pen over and drawing with the top of the nib to get those fine lines – weird but it works. If this pen continues to deliver as it did today I’ll be very happy indeed. 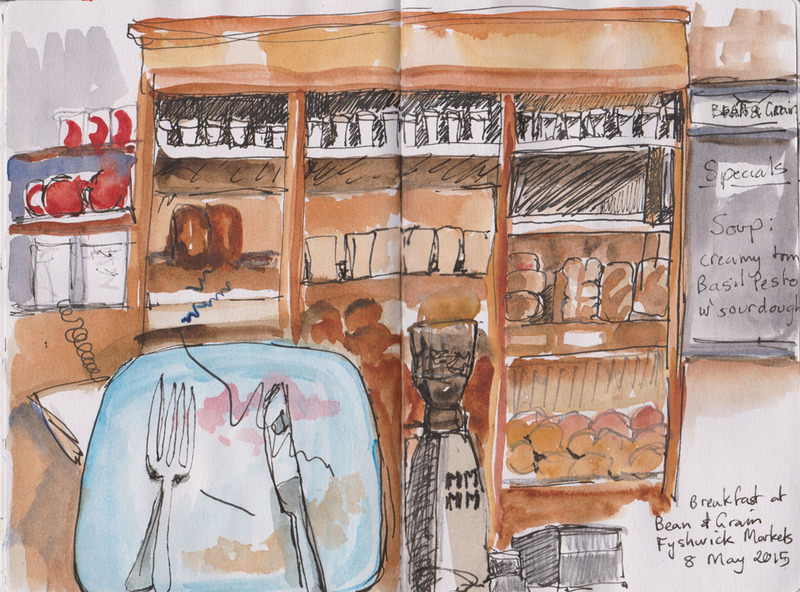 This sketch of breakfast at the Bean and Grain cafe, at the Fyshwick fruit and vegetable markets, was done in several stages. I started it several weeks ago but didn’t get a chance to finish it until last week. I decided to add my breakfast plate (after the yummy serve of bakery-made crumpets was gone) for a bit of extra interest.